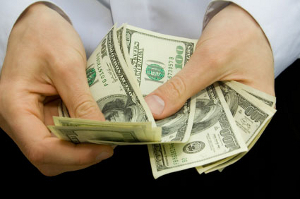 During mortgage transactions, lenders prefer to work with borrowers who invest a larger down payment. In the aftermath of the subprime mortgage market collapse, the burst of the U.S. housing market bubble, and the resulting economic downturn, the days of the no-down payment mortgage have come to an end. Except for a few specialized loan products, borrowers will need to provide some funds up front as a down payment for their home purchase. In general, down payment requirements vary between loan programs, correlating to the amount of risk each mortgage involves. Essentially, with higher transaction risk comes the need for higher down payment. While virtually all other no-down payment programs have vanished, the U.S. Department of Veteran Affairs (VA) still offers VA loans with no-down payment requirements for qualified military veterans and servicepersons. VA loans receive the benefit of a federal guarantee, through which Veteran Affairs agrees to repay a portion of the mortgage debt should the borrower default on the loan. With this reduced risk, lenders can offer borrowers mortgages without any down payment, corresponding to how much VA entitlement they possess. In addition to the VA, the U.S. Department of Agriculture (USDA) also offers a loan product with no down payment requirements: the Rural Development loan. With these loans, borrowers can finance up to 100% of the home purchase, although these mortgages can only be used for properties in areas designated “rural” by the USDA. Additionally, Rural Development loans include income restrictions that require borrowers to have a household income at or below 115% of the median income within the area of the home purchase. 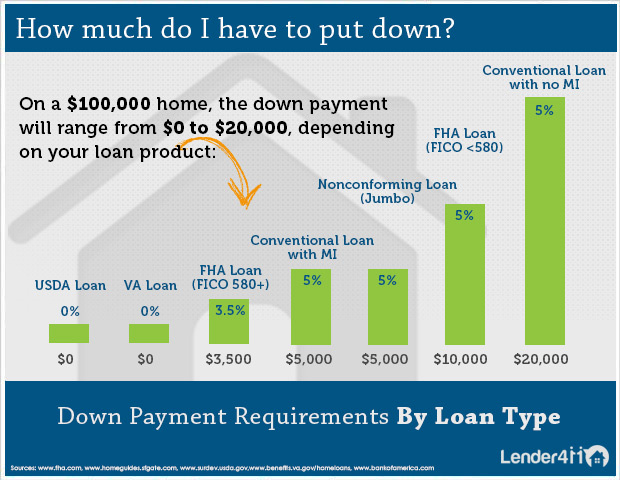 How Much Down Payment Is Required for FHA Loans? As with VA mortgages, FHA loans include a federal guarantee from the Federal Housing Administration (FHA) that protects lenders from assuming heavy losses in the event of borrowers defaulting on their mortgages. As a result of this protection and the lessened risk of lending, FHA loans provide home mortgages with minimal down payments, requiring only 3.5% of the purchase price up front for qualified borrowers. Although down payment assistance is becoming increasingly difficult to find, FHA loans allow borrowers to receive their down payment funds as a gift, from parents, relatives, etc., making these up-front sums even easier to obtain. Unlike the aforementioned loan products, conventional loans are not associated with any government agency, rather, they are loans that conform to several basic standards for the secondary mortgage market. As such, these mortgage loans include no guarantees and include more risk for lenders, prompting the need for stricter requirements. Where down payments are concerned, conventional loans require a minimum of 5% down, although borrowers who put down less than 20% for these mortgages will be subject to private mortgage insurance (PMI) premiums, which can be extremely costly and chiefly benefit the lender. Inherently, mortgages issued for the purchase of investment properties include more risk than those used to purchase primary residences or second homes. As a result, borrowers will be expected to put forth significantly larger down payments for these transactions, in some cases as much as 20% minimum, depending on the property. In order to obtain the best interest rates for these loans, borrowers will be required to put down 25% or more.